← The Perfect Clara Haskil , continued. The Perfect Clara Haskil . I first heard Clara Haskil’s name mentioned by Dinu Lipatti after a recital he gave in Switzerland. When I congratulated him on his Mozart playing, Lipatti said, “In two weeks’ time you must hear Clara play Mozart. Then you will realize how far the rest of us are from the truth.” I was young at the time, but the name stuck in my mind. Who was this mysterious Clara? Five years later during another visit to Switzerland, the mystery was solved. At a concert in the Tonhalle in Zurich on September 7, 1952, Clara Haskil was the soloist in Mozart’s Concerto in E flat, K. 271. The concert was well-nigh sold out, and the only tickets available were for the cheapest seats in the annex. Mine was behind a pillar, where I could hear well but not see. The concerto begins with a question from the orchestra that is answered by the soloist in the second bar. The question repeats, prompting the soloist to emphasize the answer. Haskil’s response aroused my curiosity and made me listen. Nothing, though, prepared me for what was to com. After the ensuing tutti, the B flat trill suddenly materialized, and I heard something akin to Mary Garden’s description of Nellie Melba’s top C at the end of the fist act of La Bohème. Likewise, I now wait for that B flat trill whenever I hear this concerto. Haskil recorded K. 271, but no recording can capture the consummate musical expression or magic of a great artist, which is something ineffable. Haskil’s performances in the concert hall were often miracles, and miracles simply cannot be reproduced. Her performance that night was greeted with stormy applause, so I seized the opportunity to look around the pillar to see who was responsible for such divine sounds. Grasping the conductor’s hand as if for reassurance and with a look of disbelief on her face, Clara Haskil acknowledged the audience’s enthusiasm. I glimpsed at the pianist who one London critic described as playing “Mozart for the Gods.” In years to come I heard her many times, both publicly and privately. For theses experiences I remain eternally grateful. As I left the hall, a friend who knew Haskil offered to take me backstage. She seemed inconsolable and unhappy, excusing her poor performance to anyone who congratulated her. When introduced, I mumbled my admiration, and she asked whether I was a pianist. After hearing such playing, I did not want to talk about my own and said I was a composer. A few weeks later I saw Clara waiting at a tram stop, looking forlorn. “Ah, the young composer,” she exclaimed, and that’s how our friendship started. Born in Bucharest on January 7, 1895 of Sephardic Jewish parents, Haskil’s musical talent was evident in early childhood. At the age of three she could pick out any tune that an older sister played on the piano. She was not yet five when a professor at the Bucharest Academy visited her parent’s home and played a Mozart sonata. When he finished she repeated the sonata perfectly, while simultaneously transposing it into another key, all without having had any musical instruction. After her father’s death, the girl’s uncle brought her to the attention of Anton Door, a celebrated piano teacher in Vienna who had known Johannes Brahms, Clara Schumann, and Joseph Joachim. Door described meeting the girl in the Neue Freie Presse in April 1902: Recently a doctor from Romania came to me, leading by the hand a little girl barely seven years of age. The child, whose mother is a widow, is unique. She has never had any music lessons beyond being shown the value and names of the notes. More did not seem necessary, for every piece of music that is played to her and which she can manage with her small hands she repeats by ear without mistake and in any key one asks. An easy movement from a Beethoven Sonata that I gave her she played at sight without difficulty. One is baffled, for this early maturity of a human brain strikes one as uncanny. In 1903 Haskil began piano studies with Richard Robert, whose pupils included Rudolf Serkin and George Szell. He took a special interest in the young artist, and soon she created a stir in musical Vienna with a performance of Mozart’s Concerto in A Major, K. 488. Two years later at age ten, she gave her fist solo recital. In 1905 she entered the Paris Conservatoire, impressing the director, Gabriel Fauré, with her musical gifts. Joining Alfred Cortot’s class in 1907, she graduated at age 15 with the Premier Prix. Extensive concert tours to France, Switzerland, Italy, and Bucharest followed. In Switzerland Ferrucio Busoni, then at the height of his career, heard Haskil play his transcription of Bach’s D minor Chaconne and invited her to study with him in Berlin. Clara’s mother declined the offer on the grounds that her daughter was too young. Instead, further concert tours were organized until the first of many severe physical setbacks brought Haskil’s concert career to an abrupt halt in 1913. In an attempt to delay the onset of scoliosis (curvature of the spine), she spent the next four years in a plaster cast. Though acclaimed in the later years as the foremost Mozart pianist of her generation, it was in such works as Islamey, The Great Gate of Kiev, Feux Follets, and the Brahms B flat Concerto – learned in two days – that she excelled in playing in those early years. 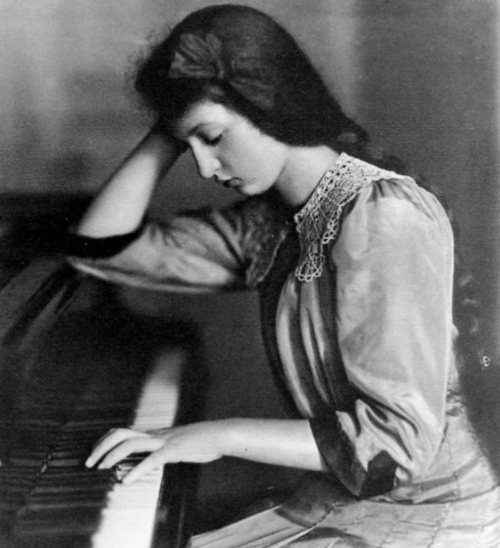 Haskil learned Feux Follets by hearing Vlado Perlemuter play the piece at a private function; then she performed the work a few days later and confessed afterwards that she had never seen the score. From early childhood Haskil was fond of the violin, especially the playing of Joseph Joachim, which nearly moved her to tears. Peter Rybar, the Swiss violinist, recalls an occasion in Winterthur in 1944 when she picked up a violin during a rehearsal break and began playing the fist movement of Mendelssohn’s Violin Concerto. Rybar could scarcely believe his ears: the playing was perfect, with impeccable phrasing and intonation, and an exquisite tone. She had hardly three years of violin study and practiced only on the day of her lesson. Throughout her career Haskil performed with such great string players as Eugène Ysaÿe, Georges Enesco, Pablo Casals, Arthur Grumiaux, Pierre Fournier, Joseph Szigeti, Zino Francescatti, Isaac Stern, Yehudi Menuhin, Henryk Szeryng, and her sister Jeanne.